This long haired cat sports an Easter bonnet with daisies on it. 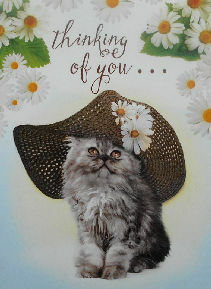 Thinking of you... is on the front of this card. Inside greeting: Happy Easter! The card is 5" wide x 7" high. Matching decorative envelope included.